Millennials: youth in the workforce - WorldCity, Inc.
Lazy. Entitled. Can’t turn off their phones. 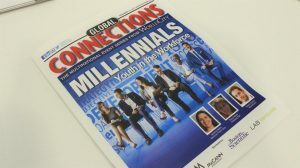 These were some of the stereotypes shared by older audience members about millennials as the Global Connections event organized to better understand that generation got under way. The three panelists, all millennials, had their own words to describe baby boomers: steadfast, unadaptive, traditional. So what can organizations learn from this first generation entirely born into the digital age that will improve the day-to-day efficiency of their businesses and, in turn, increase the bottom line? As it turns out, there is much to learn…and much to try differently. Flexibility is what matters to millennials in order to allow better work/life integration. And before you just assume this puts Marin into the lazy millennial stereotype, consider her reason why: efficiency and family. Sometimes until after midnight. Doesn’t sound so lazy anymore, does it? One audience member asked the panel if they were CEO, what would they change. 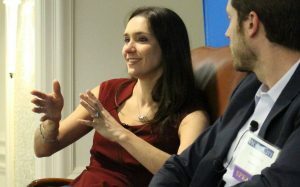 “Start measuring people by objectives and not the amount of hours they have spent in front of a computer,” said Daniel Acosta, vice president and head of processing services for Latin America and the Caribbean for MasterCard. That’s how Acosta said he views work/life balance. Measure his success by the results, not by the specific hours he’s working. Ultimately, companies embracing this leads to better retention, in Acosta’s opinion. 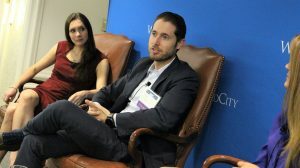 “When you give people flexibility…you start feeling a connection with your company,” he said. 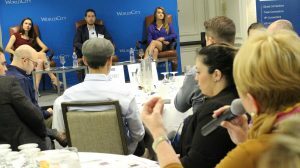 “I read something recently that the two biggest productivity killers in the office are meetings and managers,” said panelist Devon White, an inside sales analyst for Hamburg Sud. “The article also suggested everyone should have one day where you try not to speak with anyone in the office and you just focus and use passive forms of communication like e-mails and instant messaging,” said White. The idea is to find different ways to measure and increase productivity. An audience member agreed millennials are more detailed and focused, which often leads to greater productivity. Another audience member made the point that millennials constantly challenge the status quo and ask why. Millennials care more about their health at a young age than any previous generation. White noted she sometimes uses her lunch hour to get in a workout at the gym for 35 minutes then eat while on the way back to the office. Acosta noted millennials realize that if they spend their entire early life working long hours and not eating well, when retirement comes, they may not be healthy enough to even enjoy it. White is from suburban Maryland but wanted to study Spanish and now works in Miami, the epicenter of Latin American business. Acosta has lived in seven cities already and is only 32. Marin’s parents are small business owners in Puerto Rico. How many children would have even thought to pursue a career outside where they grew up 50 years ago? That ability to adapt is what the panel said they will do better than their parents and already are. 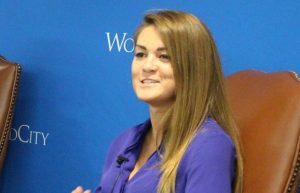 Marin noted they found traditional ways to cut costs and survive but said she felt if it were a millennial, they’d be much more determined to change it, to look at new possibilities, and try to integrate technology.